The Southern Glossary Instagram account is curated by a new artist or photographer each week. Every curator will put their own spin on the account, showing off work, their process, and their surroundings. Here's a Q&A with last week's curator, photographer Natalie Guillen. When I was a kid, I found an old camera my father had that used 110 film. I took that camera everywhere, and when my grandmother would pick me up from school, I would photograph people and things that caught my attention. Those cameras had tiny cube flashes that could only be used once. I loved that. How do you feel about the relationship of an artist to their city and surroundings? I think it inspires them. At least, for me, it does. The colors of the city in Miami and Florida are amazing for photographs in a way that you won’t find in other places. The quality of light co-mingled with the urban landscape produce imagery that is unique to this place. 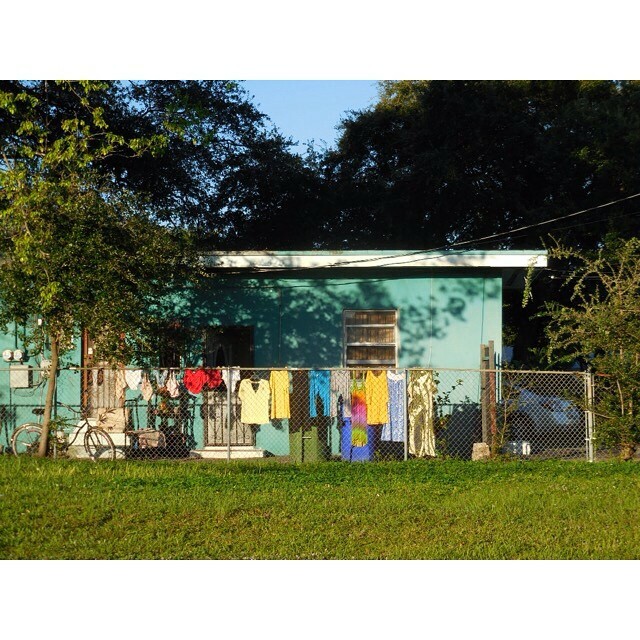 You won’t find uniformity of color here or brick; it is a blend of vibrant, bright colors that reflect the spirit of the many types of people that call Miami home. It is something that I find that I miss incredibly when I leave, feel fortunate to be able to document it photographically. Do you have a creative or artistic peer group that you are a part of? What opportunities are there for artists such as yourself? Yes, I do. I have a lot of friends not only here in Miami, but across the country that are all manner of artists: photographers, visual artists, writers, and musicians. I feel that it is really important to stay connected to people who have a certain way of perceiving the world, even if their work is something different than photography. There is an ongoing dialogue that we actively engage in, that helps my creative process. There are all kinds of opportunities for people, but I have found that the best practice is to continue to create bodies of work. This can be incredibly difficult for people depending on their economic situation, but imperative. On a fundamental level, the satisfaction of taking photographs adds to any lived experience, but there can’t be opportunity if there isn’t any work. I am motivated a lot of the time by books that I am reading when I am working on various projects. I have spent most of this year reading books that are set in Florida or deal with the history of the state. I then take day trips to locations I am reading about, or to places that remind me of what I have been reading, and go shooting. I am also constantly looking at the work of other documentary photographers and artists. I never tire of looking at the work of William Christenberry, Robert Frank, Eggleston, and Helen Levitt. There is always something to revisit and learn from. Honestly, no. I think that is what keeps me motivated, is the search for a satisfaction that may never be achieved. I am interested in the process of challenging myself, conceptually and on a formal level. I believe the practice of creating art is meant to be a series of questions the artist continuously asks themselves and of the viewer. Tell me about a recent, or upcoming project or exhibition. I have recently been shooting in some of the older neighborhoods of Miami: Little Havana, Overtown, and Little Haiti. I feel like these neighborhoods are some of the last places left that celebrate the real charm of Miami, and what it once was. I feel like a lot of people avoid these areas of the city because of class, and xenophobic attitudes towards the people that live there what they potentially represent. I enjoy photographing in these neighborhoods because there is an authenticity present not only in the faces of the people, but also in the architecture that you won’t see in other parts of the city anymore. I feel like this project is my version of Thomas Roma’s Found In Brooklyn, and I hope this shows in my images.